Cadillac has released a new commercial featuring the new Cadillac CT6, with the tagline “Only those who dare drive the world forward”. 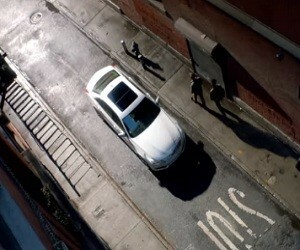 The 60-second spot depicts a city where everyone is going backwards, except the Cadillac CT6. The car is displayed from several angles, while running slowly on the streets, and the interior design is displayed, as well, with onscreen lines revealing specialty publications reviews, such as “What a comeback” (by Autobild), “Handsome, swift and cleverly built” (by Wall Street Journal), “The brand’s future has never been clearer” (by Motor Trend). The spot ends with the brand’s tagline, “Dare Greatly”.